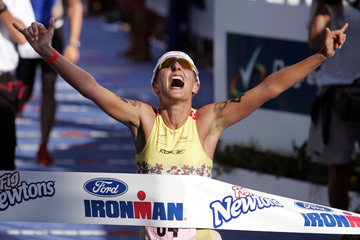 Natascha Badmann, of Switzerland, celebrated as she crossed the finish line to win the women's division of the Ironman triathlon yesterday in Kailua-Kona. KAILUA-KONA » Faris Al-Sultan regained his lead early in the run and won the Ironman Triathlon World Championship here yesterday. His time was an unofficial 8 hours, 14 minutes and 16 seconds, the fourth-fastest finish for the Hawaii race. "This is incredible; I don't believe it." he said. Prior to the race, the 27-year-old from Munich, Germany, said he just wanted to finish in the top five again. He was third last year. Al-Sultan, who won the Arizona Ironman race earlier this year, had led through most of the 112-mile bicycle ride, which took the athletes through barren lava fields and rolling ranchlands. Torbjorn Sindballe of Denmark took the lead at about the 100-mile mark but Al-Sultan regained the lead between the second and third miles of the 26.2-mile run. Sindballe, 28, faded and finished in 9:08:38 in 49th place. Cameron Brown of New Zealand was second in 8:19:33, and three-time winner Peter Reid of Canada was third in 8:20:04. Natascha Badmann of Switzerland came from behind to win her sixth women's title. Her time was 9:09:30. Michellie Jones of Australia took the lead early in the bike race and had a lead of almost 9 minutes going into the run. But after serving a 4-minute penalty, Badmann dug in and caught her around the 16-mile mark of the run. Jones was second in 9:11:50. Kate Major of Australia was third in 9:12:39. Unusually light winds allowed for fast times on the bike for the elite athletes. But clear, sunny skies created humid conditions for the run. Hirokatsu Tayama, 23, of Japan, was first to finish the 2.4-mile swim but quickly fell behind on the bike. He finished in 29th place with a time of 8:51:58. More than 1,800 athletes from all 50 states and 51 countries, and from ages 19 to 80 were registered for the 140.6-mile endurance test. Most of the sport's top professionals were vying for $580,000 in prize money. The first male and female each receive $110,000. Al-Sultan and Jones also each received $10,000 in premiums. The field included defending champion Normann Stadler of Germany, who dropped out late in the bicycle ride after two flat tires. Also competing was Luc Van Lierde of Belgium, who set the course record of 8 hours, 4 minutes and 8 seconds in 1996. Paula Newby-Fraser of Encinitas, Calif., set the women's record of 8:55:28 in 1992.